There’s nothing quite like watching a heated division race during the second half of the MLB season. In 2011, the D-backs and Giants are locked in a close-knit battle for possession of first place in the National League West. Every pitch, every at-bat and every game means something for both of these teams. 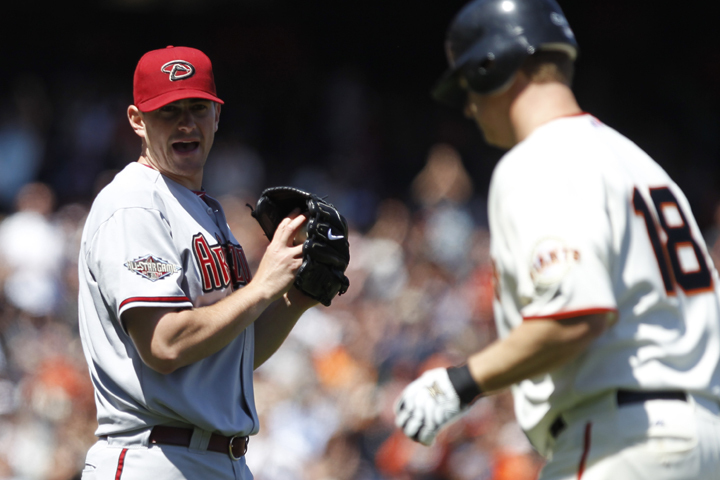 The D-backs and Giants have grown accustomed to competing in ultra-competitive, one run games. Thursday night’s series finale was no different. After the D-backs jumped ahead 2-0 in the sixth, San Francisco battled back to knot the score at 2-2 in the ninth. The D-backs headed to extra innings in dire need of a rally in order to avoid a three game sweep at the hands of their division rivals. It was Justin Upton who provided the striking blow in the 11th. The hard-hitting right-hander crushed a first-pitch home run off Giants pitcher Santiago Casilla to seal the 3-2 walk-off win. It was Upton’s first career walk-off homer, and the 3rd walk-off long ball in team history. Although Thursday night’s walk-off homer was the first of his career, Upton has tallied three walk-off hits this season. The first two were short, bloop singles to right field. 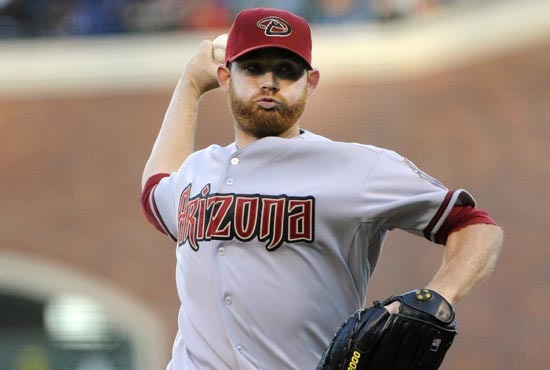 After a pair of excruciating losses to the Giants to start the series, the D-backs turned to ace Ian Kennedy on Thursday night in hopes of salvaging the series finale. Like he’s done all season long, Kennedy delivered with a stellar pitching performance. The right-hander unleashed eight innings of one run baseball. He held the Giants lineup to just four hits, walked one, and retired the side in order five times. By notching 10 strikeouts, he tied a season high, which was set on April 25th against the Phillies. In his 15 starts this season, Kennedy has now tossed six innings or more in 12 of them, including back-to-back eight inning outings in his previous two starts. It was clear that Kennedy was locked and loaded from the start. In the opening inning, he retired Aaron Rowand on a fly out before striking out both Manny Burriss and Pablo Sandoval. Kennedy then sat down the next five Giants batters before allowing a two out single in the third. An unearned run in the fifth was all Kennedy would surrender against the reigning World Champions. He quickly rebounded by posting a two strikeout, 1-2-3 inning in the sixth. The seventh frame saw San Francisco rally by placing two runners on base. Kennedy had other plans as he recorded a pair of fly outs and a ground out to escape the jam. He then posted yet another 1-2-3 inning in his eighth and final inning of work. Kennedy now owns a 1.81 career ERA against the Giants along with 49 strikeouts. In his six seasons, D-backs centerfielder Chris Young has launched plenty of home runs out of Chase Field. Against the Giants, Young drilled a 1-2 pitch into the left field bullpen for a two run homer in the fourth inning. That long ball was Young’s 14th of the season. With that home run, Young has now hit 62 home runs at Chase Field in his career. That total is the most home runs hit in the ballpark by any player since 2006. The ongoing battle for first place in the National League West continues at Chase Field this week, as the D-backs play host to the Giants in a three-game series that kicks off tonight. San Francisco comes to the desert with a slim half-game lead over Arizona in the division standings. 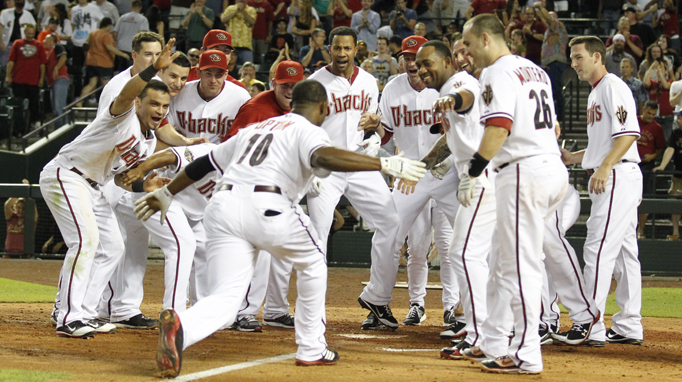 The D-backs inched closer to the top after claiming a 12-9 win over Florida last night to cap a successful road trip. Rookie hurler Josh Collmenter (4-1, 1.12 ERA) will toe the rubber tonight for the D-backs in the series opener. He is opposed by Giants’ right-hander Matt Cain (5-4, 3.36). In these two teams’ last meeting, the Giants handed Arizona three one-run losses in mid-May. The D-backs are aware that while it’s still only June, this series is crucial to the division race. After tonight’s opener, Joe Saunders will take on Madison Bumgarner in a southpaw duel on Wednesday. In the Thursday’s series finale, ace Ian Kennedy will take the mound against the Giants’ Ryan Vogelsong. The D-backs are keeping the same mindset they’ve used all season despite the increased hype surrounding the series. Fans who want to watch the fight for the top division spot can take advantage of the D-backs’ unique “BeatSF” series ticket package. By using the “BeatSF” code, fans can receive 20-percent off tickets and receive 10 free D-bucks to spend on concessions or team merchandise. Baseline reserve seats are just $20 and include $10 in D-bucks. First and third base reserve tickets are now only $40 and also include $10 in D-bucks. Who has been the D-backs MVP so far in 2011?